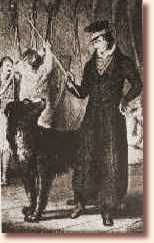 George Gordon Noel Byron, 6th Baron Byron, was born 22 January 1788 at 16 Holles Street, Cavendish Square in London. He was lame from his birth. His right leg and foot, possibly both feet, were contracted by infantile paralysis, and, to strengthen his muscles, his mother (he later attributed the deformity to her tight corsets) sent him in the summers of 1796, 1797, to a farmhouse of Deeside. He walked with difficulty, but he wandered at will, soothed and inspired by the grandeur of the scenery. The shrunken leg did not improve, and acting on bad advice his mother entrusted him to the care of a quack named Lavender, truss-maker to the general hospital at Nottingham, who ineffectually tried to cure his deformity by screwing his malformed foot into a wooden machine. His nurse who was in charge of him maltreated him, and the quack tortured him to no purpose. George was later placed under a proper doctor in London with more fortunate results. He was a "record" swimmer, and, in spite of his lameness, enough of a cricketer to play for his school at Lord's. cure the limp. This of course made Byron feel stigmatised. special braces throughout childhood. Dr. Baillie records the upshot: "Mr.
humankind, a prosthetic body inhabited by the inhuman. Shoes and feet are a recurrent image in this poem, they take on different nuances of meaning as the poem proceeds. In 1.2, the speaker compares herself to a foot (simile), that "lives" in a shoe, the shoe is her father. Analyzing this image on an abstract level is much less helpful than visualizing it. Then the image evokes various helpful associations: Commonly, a shoe protects the foot and keeps it warm, in this poem, however, the shoe is a trap, smothering the foot. The adjective "black" suggests the idea of death, and since the shoe is fitting tightly around the foot, one might think of a corpse in a coffin. The speaker thus feels at the same time protected and smothered by her father. The foot becomes a symbol of one's origin. The father's origin is mysterious and soiled, there are so many towns called Grabow that his roots cannot be traced back. An image in the second stanza makes sense now, namely that of the gray toe on the statue (that is the father). Like the father's background has the blemish of nazi Germany, the gray toe ridicules and ruins the majestic appearance of the statue. The black shoe reappears as a (military) boot in 1. 49, when the father is being called a nazi. Based on Alone (1829) by Edgar Allan Poe, describing his feelings of uniqueness and aloneness.